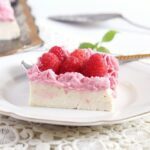 A refreshing no bake crustless ricotta and sour cream cheese cake with a delicious raspberry whipping cream topping. I cannot even begin to tell you how much we liked this no bake cheesecake!!! 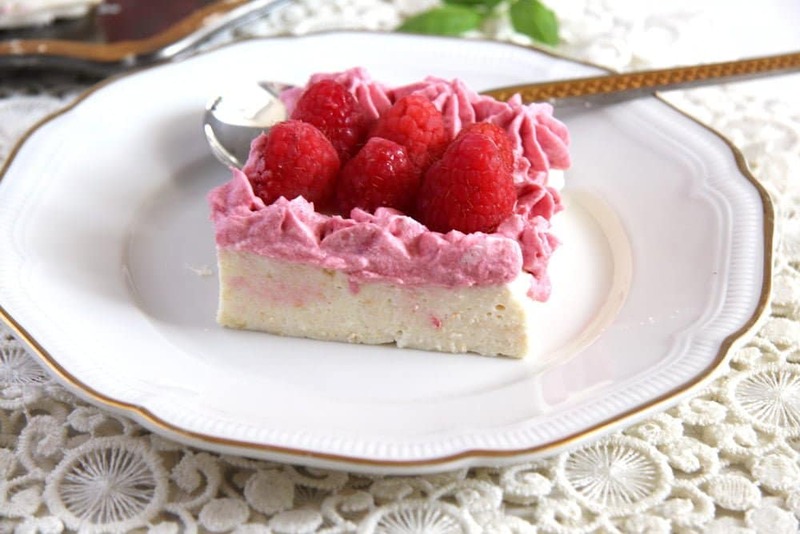 A crustless cheesecake, more like a pudding than a cake, that wonderfully soft, sweet and delicious ricotta and sour cream base topped with a luscious raspberry cream layer and with fresh raspberries. A dream of a cake, I am telling you! And such an easy to make cheesecake. No crust to worry about, not that making a crust would be difficult, but without one things get even simpler, no baking, just stirring a few ingredients and let the fridge do the rest of the work for you. 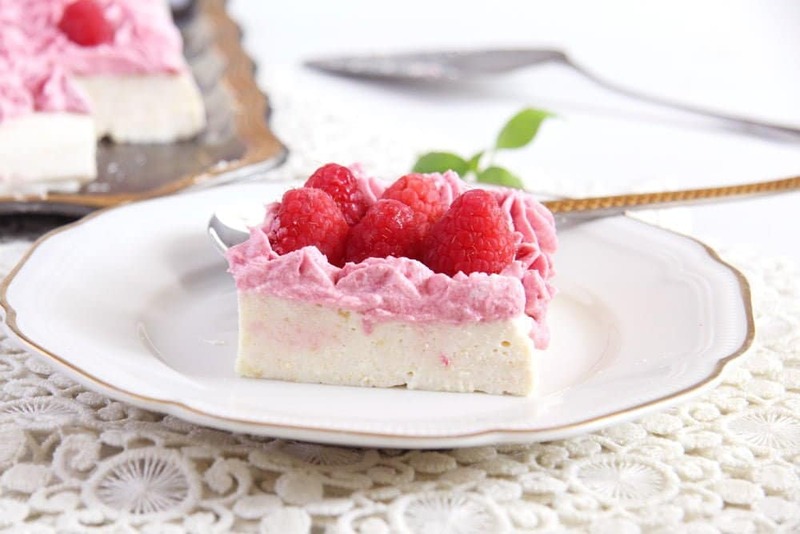 The only thing you have to take into consideration when making this No Bake Ricotta Sour Cream Cheesecake with Raspberries is the time it needs to spend in the refrigerator, you should allow it at least four five hours to get set or even better overnight. I know many people are a bit intimidated about the thought of working with gelatin, been there myself at the beginning. But please, don’t worry too much about it! Making a cake filling or a cheesecake with gelatin is really easy once you’ve done it right at least once. You will only need some clear instructions, which I hope I will be able to provide. First of all, remember I live in Germany so I work with the products we have here. In the case of gelatin as of baking powder or the stabilizer for whipping cream I use the well known Dr. Oetker products. However, I checked Amazon.com and Dr. Oetker products are available in US, for instance. I am not being paid to talk about Dr. Oetker products, it is simply that what I use. If you are unable to get Dr. Oetker gelatin, do use a similar product, just make sure you carefully read the packet’s instructions, regarding the soaking times and the way of adding the gelatin to either hot or cold mixtures. There are two kinds of gelatin: gelatin granules/powder and gelatin sheets. One packet gelatin granules equals 6 sheet gelatin, but if I need more or less gelatin in a cake it is much easier to get the right amount with the sheets than with the granules or powder. Most of the times I use sheet gelatin, because the recipes I follow do use sheet gelatin more often than gelatin granules and because sheets of gelatin are easier to divide. One packet of sheet gelatin (here in Germany) weighs 20 g/ 0.7 oz and it contains 12 sheets of gelatin, enough for 1 liter/ 33.8 fl.oz/ 4 cups liquid. One packet of gelatin powder/granules has 9 g/ 0.3 oz and it’s enough for 500 ml/ 17 fl.oz/ 2 cups liquid. Gelatine is not vegetarian or Halal or Kosher, as it is derived mostly from pork. There are vegetarian/Kosher/Halal alternatives available. Some fruit sorts like fresh kiwi, pineapple, mango, papaya and even ginger contain protein-digesting enzymes that will affect the gelatin, preventing it from setting. So when using these fruits in a recipe, go for the canned alternative. Fill a bowl with cold water and hydrate the gelatine sheets according to the packet’s instructions, I always hydrate mine for about 8 minutes. Don’t throw the gelatin sheets in a bulk in the water or they will stick to each other and the middle ones will not get properly hydrated. I always place them in water one by one, the first in one direction, the second one like a cross over it and so on. And I prefer to turn them halfway through the soaking time, so that the ones on top will get at the bottom of the bowl. In the meantime I mix the ingredients that need to be set with the gelatin. If using gelatin granules, pay attention to the quantity of water needed to hydrate it, it is important in this case, you do not want to have too much or too little water. The gelatin powder I use requires 4-6 tablespoons of water, so I always use 5. 🙂 Fill the required amount of cold water in a small pot (normally the one I would use for dissolving the gelatin once soaked) and sprinkle the gelatin on top. Once again, don’t just throw it in there or the middle parts will not hydrate properly, sprinkle the gelatin evenly on top of the water and stir gently to mix. The gelatin granules need 10 minutes to bloom. 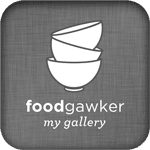 This is the easier method, the one you will use when making desserts like Panna Cotta, for instance, where the cream has to be heated before allowing it to set. 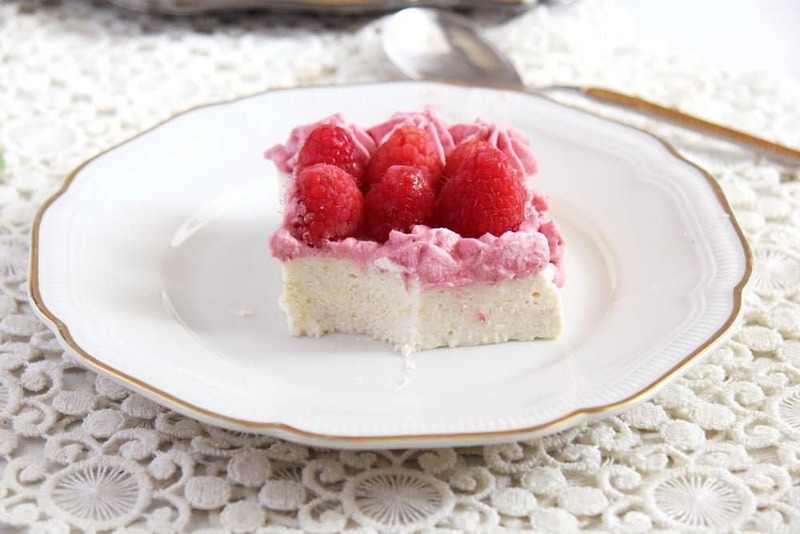 In this cake warm the milk/cream-sugar mixture gently, then add the hydrated gelatin to it and stir thoroughly to make sure that the gelatin is properly dissolved. Very important! Do not add the gelatin to boiling liquids or it will “die”! The temperature of the product you are stirring it into should not be higher than 80 degrees Celsius/ 175 degrees Fahrenheit. You will not need a thermometer for this, just make sure that the mixture is not boiling, the liquid should only be warm. The procedure is the same for both gelatin granules or gelatin sheets. Give the bloomed gelatin sheets to a small saucepan, yet large enough to hold the entire mixture you intend to mix with the gelatin. Place the sauce pan on your smallest burner and turn the heat on keeping it at its lowest setting. Squeeze the gelatin sheets gently and then give them to the saucepan. Dissolve the gelatin very quickly while stirring all the time and turning off the heat the moment the gelatin is melted and liquid, do not let it come to a boil or the gelatin will “die” again. Dissolving the gelatin will only take seconds, about 20 or 30, so stand by, stir and pay attention. Start adding the liquid or dairy mixture to the gelatin only one tablespoon at a time. Add the first tablespoon, incorporate it completely, then add the second tablespoon and so on. After adding about ½ or ¾ of the liquid in this manner, you can start adding more than one tablespoon at a time to the mixture, 2-4 tablespoons at a time, for instance. If you add more than one tablespoon from the beginning, the gelatin will get cold too quickly and it will clump. The procedure is the same for both gelatin granules or gelatin sheets, but in the case of the gelatin granules, you will not have to squeeze the gelatin, that is why the amount of water you will use has to be measured before. Many recipes require whipped cream to be added to the mixture that is about to set. I always do that after mixing the main mixture with the gelatin, otherwise the whipped cream will lose its airiness. So, after making the initial gelatin mixture, I place the pan in the fridge for at least the time needed for me to beat the whipped cream. However, this initial setting time differs from recipe to recipe and depends on the amount of liquid you have. Some mixtures only need 5 minutes to begin to set, while others need half an hour. Make sure to follow the recipe instructions and check the mixture in the fridge every 5 minutes or so. It is important to add the whipped cream when the initial mixture has only begun to set. If you wait too long, the mixture will not be smooth anymore, it will have little clumps all over. The gelatin mixture will need at least 4-5 hours to set, but I always let them set overnight in the fridge. Soak the gelatine in cold water according to the packet's instructions, I soak mine for about 8 minutes. See detailed instructions for working with gelatin above. Soak the lady fingers in the milk. Mix together the ricotta, smetana or sour cream, sugar and lemon zest. Mash the soaked lady fingers and give them to the ricotta mixture. Mix well. Place the soaked gelatine leaves into a saucepan. Turn on the lowest burner and dissolve the gelatine on very low heat while stirring all the time. It will only take a very short time, about ½ a minute until the gelatine is dissolved. Do not let it boil! Read the packet's instructions as well before you start working with the gelatine. Take off the heat and quickly stir in one tablespoon of the ricotta mixture. Add the remaining ricotta mixture, one tablespoon at a time, only adding the next tablespoon when the previous is completely incorporated. Place the mixture for about 5 minutes in the refrigerator until it starts to set, only starts to set, don't let it set yet. In the meantime beat 250 ml/ 8.4 fl.oz/ 1 cup of the heavy cream shortly. Slowly add 1 packet vanilla sugar. Continue beating until the heavy cream is stiff. Fold the heavy cream into the ricotta mixture. Line a baking dish of approximately 21x32 cm/ 8x13 inch with cling film. Pour the ricotta – heavy cream mixture into the pan. Shake the pan to help the mixture spread evenly into the pan. Cover with another piece of cling film and place in the fridge for at least 4-5 hours or until set. When set remove the cling film from the top of the cake. Place a fitting serving tray on top of the baking dish and turn the cake onto the serving tray. Remove the other piece of cling film. Beat the remaining heavy cream/whipping cream with the remaining packet of vanilla sugar and the stabilizer for whipped cream. Puree half of the raspberries and fold the puree into the heavy cream. Pipe this mixture over the ricotta cake. 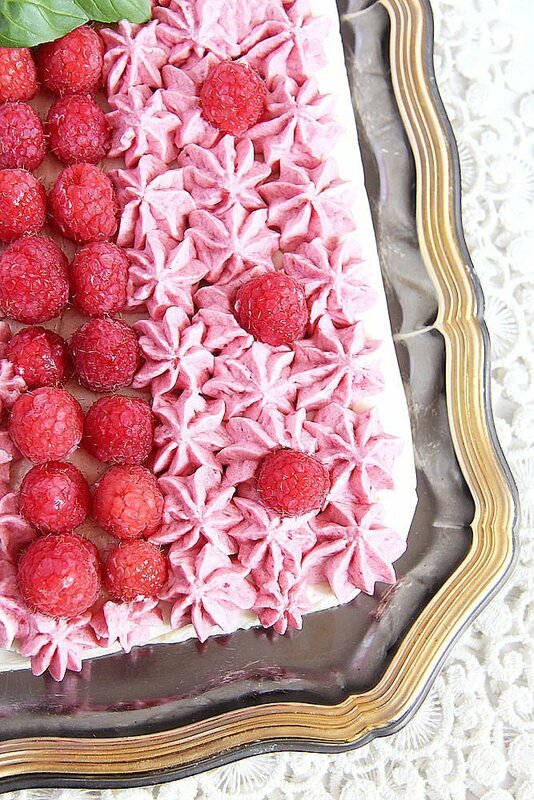 Decorate with the remaining raspberries. Serve immediately or place in the fridge until ready to serve. 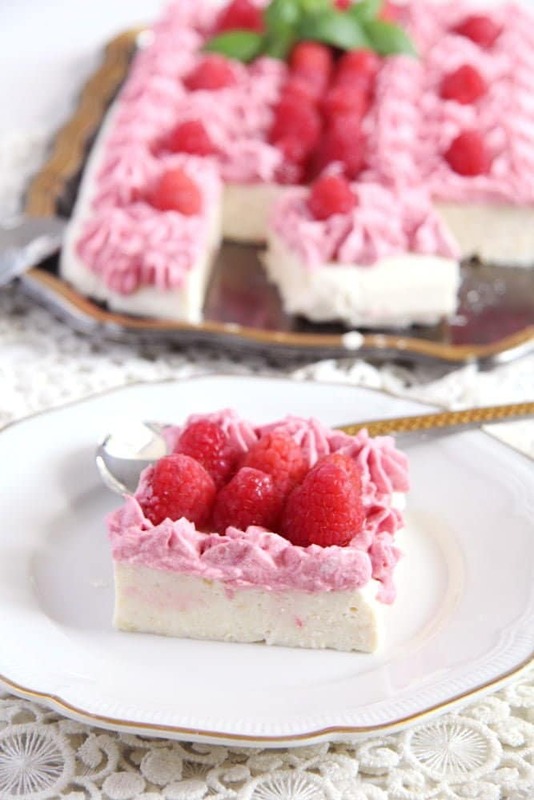 That raspberry whipped topping looks so good! 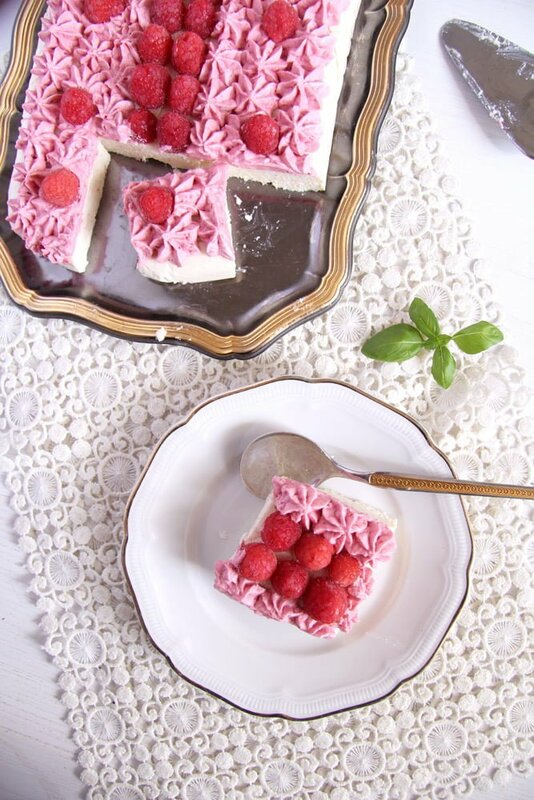 No bake cheesecake is a very popular summer cake in Poland and I always loved it apart from the jelly top most people covered it with (I don’t know why but I hate sweet jelly…). 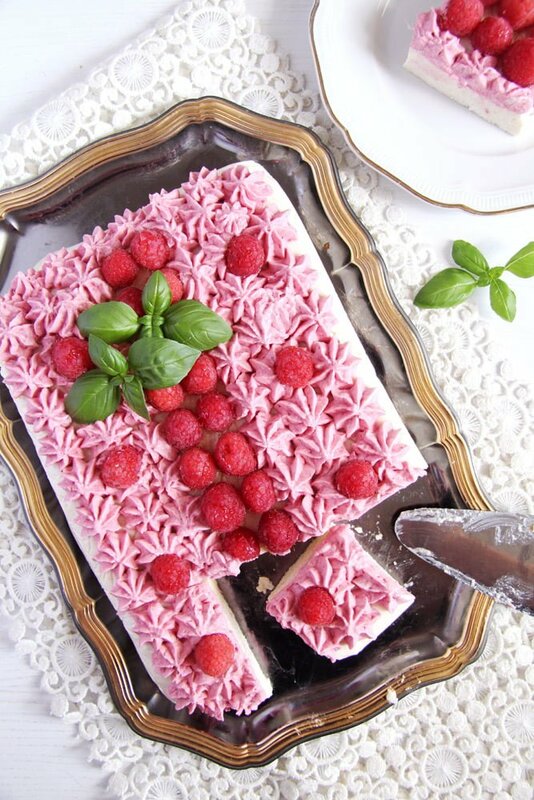 Your cake doesn’t have one and it’s so packed with delicious raspberries I am sure it tastes fantastic. (I also like Dr Oetker products! They always work, contrary to some other brands). What a lovely idea of making ricotta and sour cream cheesecake. And that whipped raspberry is so pretty. I wish I could have a BIG slice of this cake.